Candoni De Zan Wines now available at Buca Di Beppo Restaurants with three of Candoni wine offerings now presented tableside at national Italian chain. Candoni de Zan Family winemakers are proud to announce that as of April 2016, Italian restaurant franchise Buca di Beppo will offer three specially-chosen wine blends tableside at all their U.S. locations. In conjunction with Buca di Beppo’s new menu release in April, diners will now be able to enjoy the Candoni Buongiorno Organic Red Blend, Carletto Montepulciano d’Abruzzo, and Polvano Nero Blend, all under the Candoni de Zan Family label. All three reds were hand-selected for their vibrancy, distinctiveness, and exceptional pairing qualities. 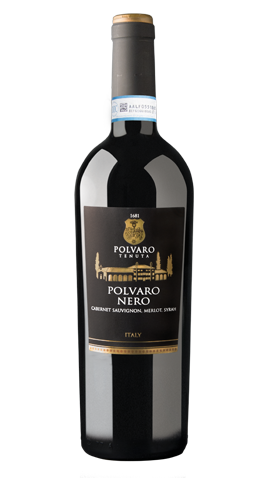 The Polvano Nero Blend, available only by-the-bottle, gets its spicy plum, blackberry, and cherry aromas from a blend of Cabernet Sauvignon, Merlot, Syrah, and Refosco grapes. Carletto’s Montepulciano d’Abruzzo was selected for its bold ruby color and fresh, explosive cherry and spice aroma. 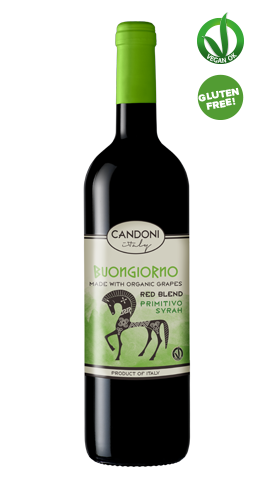 The Candoni Buongiorno Organic Red Blend fills a unique niche, offering a dark, rich red comprised of Primitivo and Syrah grapes grown without the use of herbicides, fertilizers, or other synthetic chemicals. In fact, the blend is actually the first Italian vegan- and organic-certified wine. “It’s a wine diners can feel great about drinking,” says Armando De Zan, CEO of Candoni De Zan Family wines. “It’s as good for the planet as it is delicious!” "Our winery is a family business built on traditions and many of our organic wines are perfect for people who are careful about what they eat or drink," adds Elviana Candoni De Zan (Co-Founder). Polvaro Premium Estate Wines, Candoni Wines and Carletto Wines are all part of the Candoni De Zan Family. The Candoni and de Zan families have been making and distributing wine since the late 1800s, enjoying a longstanding reputation for producing exceptional wines. The company is still family owned-and-operated out of Veneto, Italy. Buca di Beppo is an American restaurant chain specializing in family-style Italian fare. With over 90 locations nationwide, Buca restaurants are known for their themed rooms and reasonably priced meals. The company is headquartered in Orlando, Florida.